Spring is no longer something to look forward to—it's here. Naturally, the first fashion item on deck is a fresh batch of dresses, and there's one style we're already seeing everywhere: the smock. Voluminous tiered dresses emerged on the runways at Ganni and Cecilie Bahnsen, and quickly became a street style micro-trend during Copenhagen Fashion Week. But if you didn't catch onto the trend last summer, the good news is that smock dresses are only gaining more popularity this spring. Even better news? We have our very own version for our Who What Wear collection at Target, and naturally the $35 dress is already a hit among fashion girls across the U.S.
Aside from the trend factor, the Button-Down Flowy Tiered Mini Dress is the ideal spring dress since its flowy shape is beyond comfortable and it goes with everything from flat sandals to ankle boots and heels (as you'll see in the below gallery), making styling it a breeze. To see our favorite outfits with the dress from Instagram and shop it yourself, keep scrolling. I styled the dress in black alongside our Danielle Vinyl Heeled Mules which are sadly now sold-out in black (but still available in beige! ), a satin bag, and pearl jewelry. Lauren Conrad is a fan. Need we say more? The dress plays quite nicely with spring accessory trends like headbands, heart earrings, and netted bags. Dress it up for date night with heeled sandals. 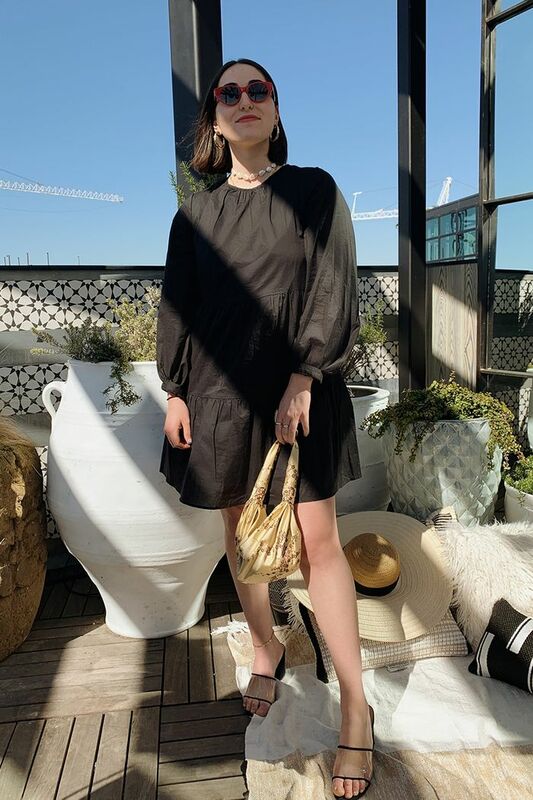 Another A+ case for the dress with our popular Danielle mules. Steal this genius styling idea for the office and beyond. The floral printed version makes an excellent base for black accessories. The stuff of our dressing-room-selfie dreams. Next, the perfect under-$30 tops to wear with jeans.